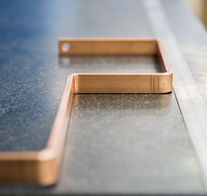 At Metelec, we carry a wide range of oxygen free copper. 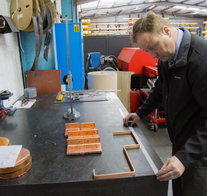 All of our oxygen free copper is manufactured within our extended group. 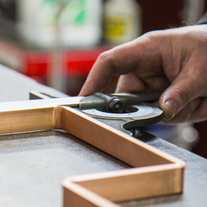 Most of our oxygen free copper at Metelec is available from stock and all bespoke products within the scope of our manufacturing range can be made available on short lead times. The stock range of oxygen free copper is unrivalled but to fully appreciate the diversity of this range please give us a call on +44 (0)1922 712665. This material is for electronic and similar applications. We supply a very high-purity certified grade copper with a minimum electrical conductivity as high as 101.5 IACS. The total content of impurities is less than 40 ppm (0.0040%), no single impurity exceeding 25 ppm (0.0025%). This is to ensure high resistance to hydrogen embrittlement. The maximum oxygen content is restricted to 5 ppm (0.0005%). The benefits of using oxygen free copper are realised by the low content of the highly volatile elements such as phosphorus, lead, arsenic, sulphur, zinc, cadmium and mercury resulting in low volatility under high vacuum and making OFE-Cu certified grade copper a product of major interest to the electronics industry. 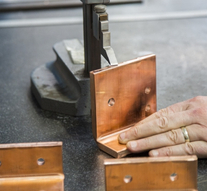 It is readily joined by brazing or welding and is the superior grade of copper for electron beam welding. OF-Cu copper is immune to embrittlement when brazed, welded or held at high temperatures in a reducing atmosphere. It is also dimensionally stable when heated in hydrogen atmosphere which can be a necessity in certain applications. Qualities:- High purity, highest possible electrical / thermal conductivity, excellent formability and impact strength, excellent weldability and brazability qualities, excellent for high-vacuum applications, excellent surface quality, very adherent oxide scale, high homogeneity and reliability & immune to hydrogen embrittlement.